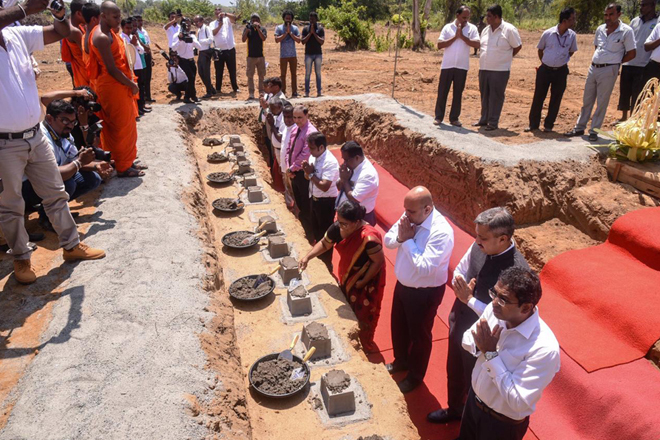 Mar 30, 2019 (LBO) – The construction of Sri Lanka’s first Temperature and Humidity Controlled Warehouse Complex for Perishables was initiated today by the Economic Reforms Minister Harsha de Silva and the High Commissioner of India, Tharanjith Singh Sandu at the adjoining land of Dambulla Economic Centre. The proposed Cold Storage complex with a capacity of 5,000 metric tons is comprised of six separated sections of different temperature and humidity levels and capable of storing the excess harvest of vegetables and fruits. With this facility, the farmers in the area will be able to store their excess harvest at a concessionary price for a much longer period. This Agro Cold Storage complex is constructed with a financial grant from the government of India and it is scheduled to be completed within six months. “During the periods when there is an excess harvest, farmers had to throw the excess harvest for elephants to eat. For a long time, I was searching for an answer to this question. I had an interest in doing something on this since 2002,” Minister De Silva said at the inauguration ceremony. This year’s budget provides a series of tax concessions for investors investing in climate-controlled logistic facilities and the Ministry plans to give opportunities for investors to construct a vegetable and fruit processing complex around Dambulla cold storage complex. This program is being implemented by the Food Commissioner’s Department of the Ministry of Economic Reforms and Public Distributions with the help of the Food Commissioner J Krishnamoorthy. This is the first step towards innovative diversion of farmer’s surplus stored in the cold storage facilities, to local and foreign markets on time. The Ministry is planning to build new agro-storage complexes in Keppetipola covering the Central Province, in Jaffna covering the Northern Province and in Embilipitiya covering the Southern Province.